Why Blogger Outreach is Popular These Days? You are here: Home / Internet / Why Blogger Outreach is Popular These Days? Blogger Outreach has become a new buzzword among the online marketing professionals. Step back few years from now and you will find there was no such thing as reaching bloggers for the promotion of products or brands. However, contemporary trends are shifting to a new angle and now bloggers are being regarded as the source to attract customers’ attention (without being chatty in the social sphere). Through this post we will delve deep into the reasons behind the surge in the attraction towards bloggers, and the benefits marketing professionals can gain from blogger outreach. According to a consumer behaviour report by Technorati, almost 31% of the consumers prefer blogs to decide over any product or service. The decision making phase of the consumer is the vital moment for any company. Influencing the customers at this phase would be enough to attract them towards the required result. Therefore, working with the bloggers to influence such customers would be a winning first step. Most of the bloggers are being followed religiously by their readers. Moreover, these bloggers are considered as authority on the subjects they blog about. Therefore, they easily influence the decision of their target audience. Such influence cannot be garnered by the companies while directly advocating their own product. Bloggers are considered as the excellent example of word-of-mouth promotion. They help you reach your target consumers without you being actually involved in the process. The only thing you have to do is to attract them towards your product, either by giving a free product or some other incentives. Bloggers use social media marketing tactics having direct access to your customers through their mailing lists or social profiles, and they can help you reach your message directly to their inbox without costing you a dime. They can send personalised emails to the target audience that has greater chances of positive influence. Most of the bloggers have found that their suggestions on any product or service have greatly influenced their audience’s purchase decision. Instead of instant gratification from the one time posts by a blogger, marketing professionals should focus on building relationships with them. This will ensure future, no-hassle re-promotion opportunities. You cannot expect more by giving less. Therefore, if the favour from your selected blogger is substantial, then always try to give something of importance in return. All your emails should reflect the same orientation. Prospecting for your target bloggers is not a one time job, and, therefore, more you do, more will be your increased influencers list. 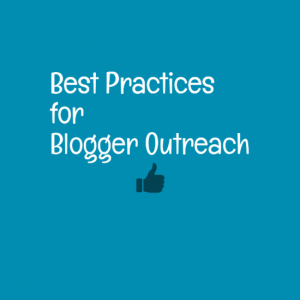 Your reach or influence depends on the number of bloggers you outreach every day. You can think blogger outreach as an exponential of influence mathematics. Your one influenced blogger can influence thousands in return. Share your stories in the comment below on how you have fared well so far in attracting bloggers for your products or services.